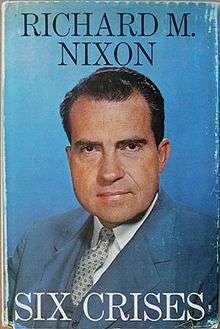 Six Crises is the first book written by Richard Nixon, who later became the thirty-seventh president of the United States. It was published in 1962, and it recounts his role in six major political situations. Nixon wrote the book in response to John F. Kennedy's Pulitzer Prize-winning Profiles in Courage which had greatly improved Kennedy's public image. In 1948, Nixon was a member of the United States House of Representatives serving on the House Un-American Activities Committee, which was investigating communism in the United States. He first rose to national prominence when the committee considered accusations that Alger Hiss, a high-ranking United States Department of State official, was a communist spy for the Soviet Union, which post-Cold War research in Russian archives proved to be correct. In 1952, as a member of the United States Senate, Nixon was the Vice Presidential running mate of Republican presidential nominee Dwight Eisenhower. After he was accused during the campaign of having an improper political fund, he saved his political career and his spot on Eisenhower's ticket by making a nationally broadcast speech, commonly known as the Checkers speech. In the speech, he denied the charges and famously stated he would not be giving back one gift his family had received: a little dog named Checkers. In 1955, while Nixon was vice president, President Eisenhower suffered a serious heart attack; during the next several weeks, Nixon was effectively an informal "acting president". In 1958, Nixon and his wife embarked on a goodwill tour of South America; while in Venezuela, their limousine was attacked by a pipe-wielding mob. In 1959, while still vice president, Nixon traveled to Moscow to engage in an impromptu debate with Soviet leader Nikita Khrushchev. The debate took place in a mock kitchen that was intended to show Soviet citizens how ordinary American families lived, and came to be known as the Kitchen Debate. In 1960, while finishing his second term as vice president, Nixon became the Republican nominee for President; in the general election he lost an extremely close race to Senator John F. Kennedy. ↑ Matthews, Christopher (1997). Kennedy & Nixon: the rivalry that shaped postwar America. Simon and Schuster. p. 106. ISBN 0-684-83246-1. ↑ Delson, Rudolph (November 10, 2009). "Literary Vices, with Rudolph Delson: Richard Nixon's 'Six Crises'". The Awl. Retrieved February 22, 2011. ↑ Roper, Jon (1998). "Richard Nixon's Political Hinterland: The Shadows of JFK and Charles de Gaulle". Presidential Studies Quarterly. Retrieved February 22, 2011. ↑ Linder, Douglas O. (2003). "The VENONA Files and the Alger Hiss Case". Faculty site, University of Missouri-Kansas City School of Law. Retrieved March 31, 2015.